A CVT, or Continuously Variable Transmission, is completely different from anything you're probably used to. And the first time you drive one, it's downright weird! When you take off from a stop, the car begins to accelerate normally, with engine and vehicle speed increasing as you apply the gas. Then, as you continue to accelerate, engine RPM stops increasing while the car keeps moving faster. It's a strange feeling that takes a little getting used to. The CVT operates with two variable pulleys and a special belt running between them. The pulleys open and close, adjusting their effective circumferences. 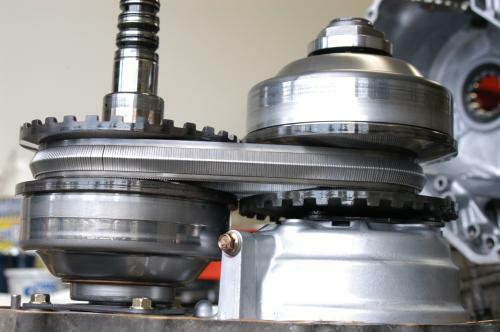 The belt moves in or out along the pulleys, altering the transmission's effective ratio. CVTs have fewer moving parts, creating a "simpler" design. But their biggest advantage is to provide a continuous variety of ratios. So cars with CVTs can always adjust their ratio to match road conditions and engine RPM precisely. While the design may be simpler, CVTs bring an entirely new set of requirements to the transmission technician. And no one has more experience with CVTs than your local Cottman center technicians. They began to learn about CVTs the moment the first ones rolled off the assembly lines, back in the late '80s. And they kept up with the changes to these units as they became more common... and more diverse. Today nearly every manufacturer offers at least one continuously variable transmission for their cars. And that means there are dozens of different ones on the road. That's okay: Your nearby Cottman center technician has all the technical data for each of those transmissions at his fingertips, so, no matter which car you drive, they have the skills and the knowledge to diagnose and repair them right. If you have a car with a CVT, and it isn't acting the way you've come to expect, there's just one name you need to remember: Cottman.